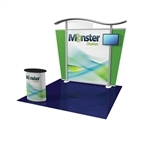 When a turn-key design is needed, Monster Displays has you covered. From flooring to graphics, to backwalls, to lights, our Monster Packs feature complete kits to get you started right away. Looking for something a little different? No problem! Just call our team of exhibit experts for complimentary assistance on making your own pack - loaded with all the high-impact displays and accessories to fit your marketing needs. And remember we can also help installation and dismantle services. We are here to answer your questions, so just give us a ring!